Okay, normally I like to make fun of recipes that have a lot of buzzwords in the title like my post — vegan, whole grain, and refined-sugar free! Obviously I deserve a medal here, right? I think the only buzzword that I'm missing is "gluten-free", which these cookies are sadly not. But I'm going to be honest here — with warmer weather coming, I'm starting to feel self conscious about all the nights I spent this past winter eating ice cream to my heart's content. I've recently switched my exercise routine and have been trying to run five miles every other day, but ohmygod am I out of shape! In college, when I ran half marathons and 15ks on a somewhat frequent basis, five miles seemed like such a breeze. But my last few runs have been slow and lumbering, like I'm definitely carrying a couple of pounds more than I should. Ah, the price of being a dessert blogger. A few weeks ago, I received Honey & Oats, a wonderful cookbook filled with dessert recipes with a twist: all the refined flours and sugars that I normally use without abandon have been replaced with healthy whole grains and natural sweeteners. Flipping through the book's pretty pictures, I couldn't decide what to make first. I saw classic desserts like snickerdoodles, blueberry muffins and yellow birthday cake that used whole wheat flour and alternatives like barley and rye, as well as natural sweeteners like honey and maple syrup. All looked tasty, but I decided to test-drive with the classic chocolate chip cookie recipe. 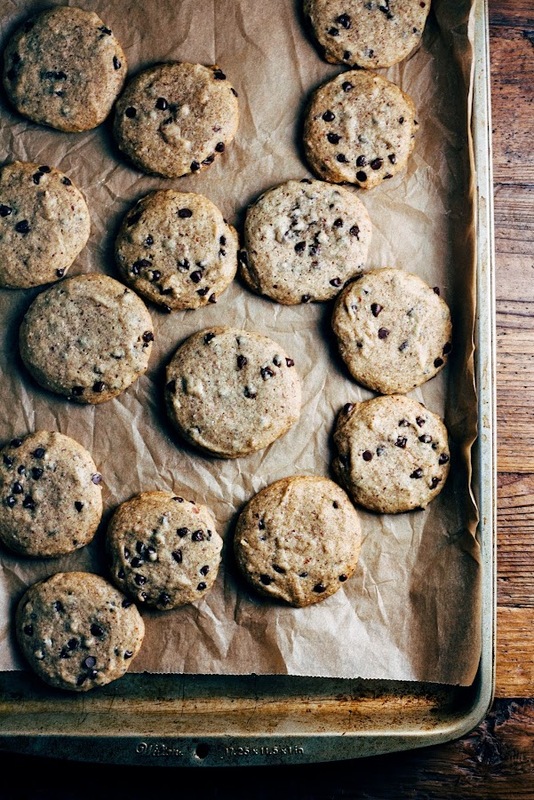 After all, what good is a baking book without a solid chocolate chip cookie recipe? Luckily, Honey & Oats delivered. My housemates devoured the cookies before I'd admitted they were vegan; both were shocked and hadn't been able to tell! 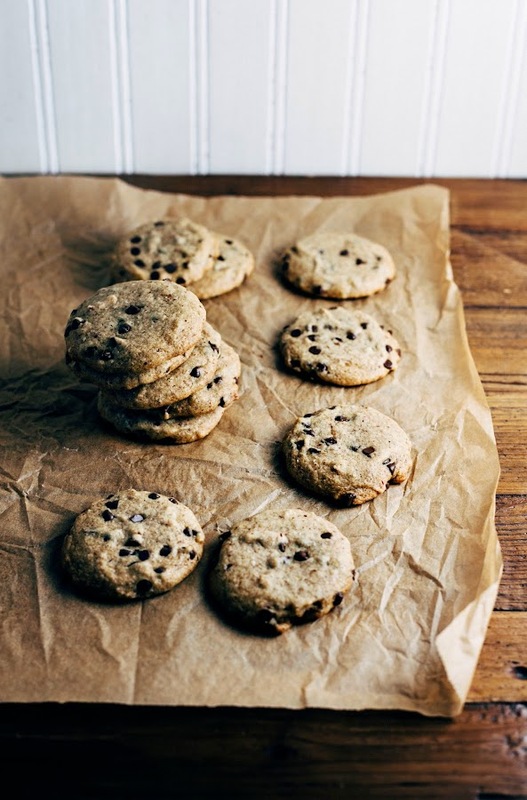 Admittedly, my palette is a little bit more refined when it comes to desserts — I found that the cookies were missing the traditional "crisp on the outside, chewy on the inside" texture. But this isn't a bad thing! Their texture is more tender, being somewhat softer and looser. 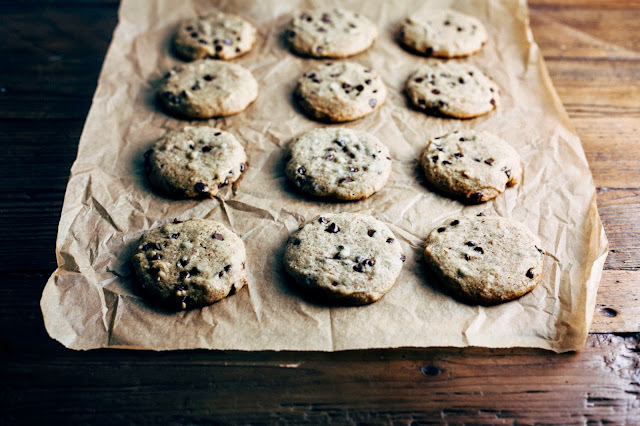 Both the almond meal and maple syrup added subtle, nutty notes that you wouldn't find in a regular chocolate chip cookie. These were also great for breakfast; there was one day in which I was running late, missed my chance to make breakfast and decided to grab a couple cookies to eat as I rode my bike to work and was surprised to find that it kept me full until lunch! Overall, big thumbs up for this recipe — I'm getting to that age where I really can't eat all the flour and sugar that I used to be able to eat without consequences, so don't be surprised if you see more recipes like this one in the future... maybe. At least that's what I'm telling myself right now. Yeah, let's see how long that lasts. According to Honey & Oats, spelt flour has a ton of fiber, calcium, vitamin B and 30% more protein than regular whole wheat flour! Super healthy, right? Spelt gives baked goods a grainy texture, while maintaing a tender crumb. It is a little bit hard to find (I found mine in the bulk section of the hippie food co-op near me), but you can substitute it with whole wheat flour or all-purpose flour (but it won't be as healthy). Because the dough doesn't have butter or granulated sugar, it does not go through the typical creaming process that makes it light and fluffy. When you're finished mixing all the ingredients, the dough will seem a little bit thin and liquidy, but that's fine. If you have trouble scooping the dough into balls, you can chill the dough in the freezer for 10 minutes to help keep it together. Preheat the oven to 350 (F) and prepare a baking sheet by lining with parchment paper. In a medium bowl, whisk together 1 cup plus 1 tablespoon light spelt flour, 1/2 cup almond meal, 1/4 teaspoon kosher salt and 1/2 teaspoon baking soda until well combined. Set aside. In a large bowl, whisk together 1/3 cup canola oil, 1/3 cup maple syrup, and 2 teaspoons pure vanilla extract until well combined. Gradually add the dry ingredients (from the 2nd step) to the wet mixture, mixing until just combined. Use a rubber spatula to scrape the sides of the bowl, before folding in 3 ounces dark chocolate chips. Use a 1 tablespoon sized cookie dough scoop, portion out 1 tablespoon sized dough balls. Place each dough ball on the prepared baking sheet at least 2 to 3 inches apart. 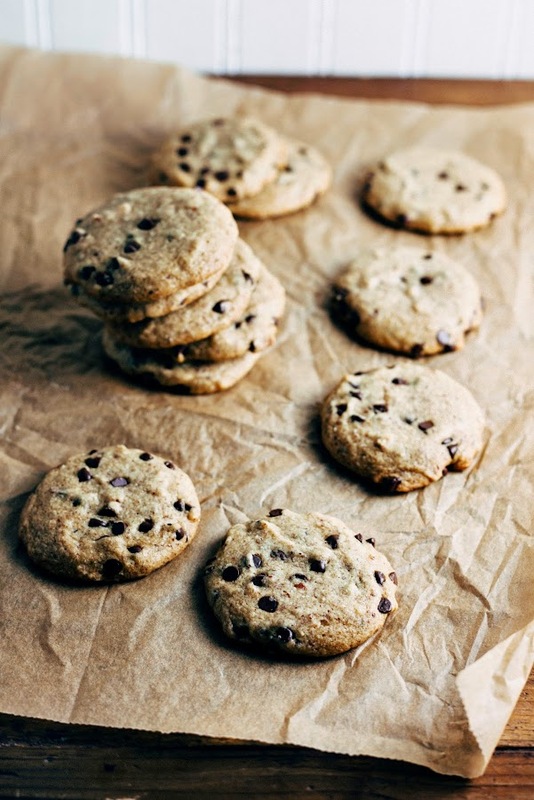 Bake in the preheated oven until the cookies are golden and slightly firm to the touch, about 10 minutes. Once the cookies are finished baking, transfer the cookie sheet to a wire rack and allow the cookies to cool on the baking sheet completely. I completely feel you on the 'dessert blogger extra lbs'. I'm running a half marathon tomorrow but the training was no easy feat! love the healthy twist! Is spelt meal the same as spelt flour? Oh these look fantastic! 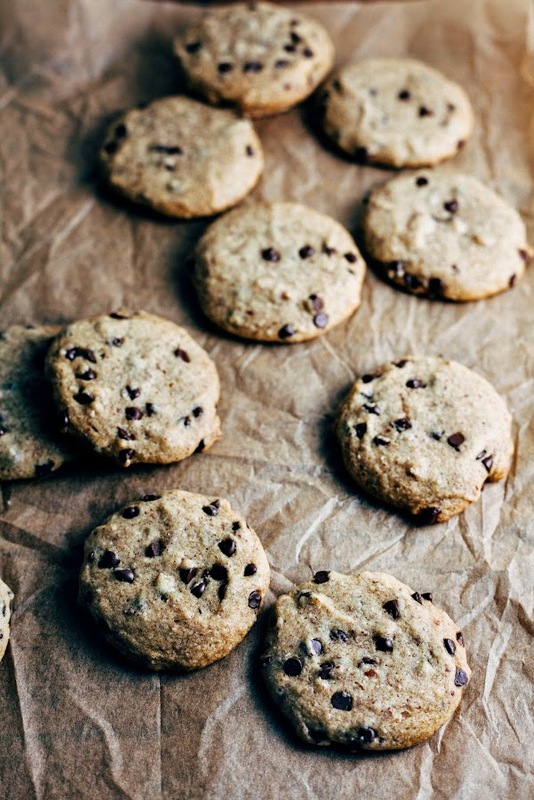 I love the healthier take on the standard chocolate chip cookie. Oh yes, I'm feeling in the need to inject a bit of goodness back into my diet. 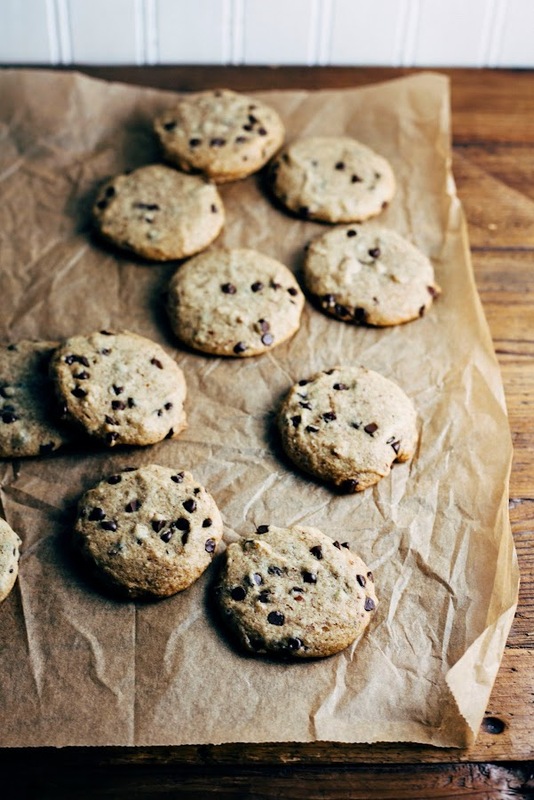 I love the sound of these cookies (and this cookbook!) and your photos are absolutely wonderful, as ever. YUM! What is a good place to get that special flour? Whole Foods? Whole Foods has spelt in both their bulk and their baking section (I think they sell Bob's Red Mill spelt flour). New Seasons also has it in their bulk section. could you use coconut oil instead of canola? whole meal refers to whole flour while fine flour is white flour.Spelt is 20 times more alkaline than wheat because of all of the minerals. Natural products distributors have it available; convince your favorite store to carry it and they can order it in. It is not cheap; but if you want something tasty, wholesome, nutritious and not spoiled by man then it is well worth the price. Friends will wonder what secret ingredient you are using in an already perfect recipe.